Jeff Bezos’ spaceship company Blue Origin broke ground Friday on a rocket-engine production facility in Huntsville, Alabama, that will cost more than $200 million and employ about 300 when it opens in March 2020. 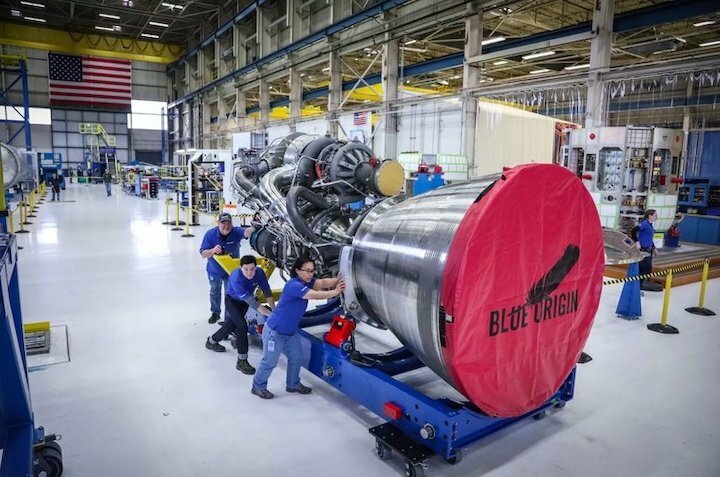 The facility will build the BE-4 engine that Blue Origin expects to finish developing later this year. “It is currently rocking our test stands out in West Texas,” Blue Origin said in a news release. Blue Origin designed and builds its initial rocket engines, the liquid hydrogen-fueled BE-3 engines, at its Kent headquarters. The BE-3 powers the company’s current New Shepard reusable launch rockets, which are designed for suborbital flights, including taking tourists into space. The more powerful BE-4, fueled by liquefied natural gas, is intended to boost into orbit and beyond Blue Origin’s 313-feet-high New Glenn heavy-lift launch rockets now being developed. Seven BE-4s, with a combined thrust of nearly 4 million pounds, will power the reusable first stage of New Glenn, which will be built in a new facility beside the launchpad at Cape Canaveral in Florida. The upper stage rocket for New Glenn will be powered by a variant of the BE-3 engine, called BE-3U, that will also be built in Huntsville. And two BE-4 engines will power the first stage of the Vulcan rocket being developed by United Launch Alliance (ULA), the Boeing/Lockheed Martin joint venture. The Vulcan rocket will be built at ULA’s manufacturing, assembly and integration facility just across the Tennessee River from Huntsville in nearby Decatur. In October, the Air Force selected the New Glenn and Vulcan rockets for a contract to launch future national security missions into space. When those rockets are operational, the BE-4 engine will end the U.S.’ current dependency on using Russian RD-180 engines for critical national security launches. Known as “Rocket City,” Huntsville has the highest ratio of engineers to residents in the U.S. and a low cost of living. It’s been the center of U.S. rocket research ever since 1950, when the government set up a base there for Wernher von Braun and his team of former Nazi rocket scientists who had developed the V-2 rocket-powered missiles during World War II. It’s also the home of NASA’s Marshall Space Flight Center as well as the U.S. Army’s Aviation and Missile Command and the Pentagon’s Missile Defense Agency, both at the Redstone Arsenal. NASA’s Space Launch System program, the U.S.’s next-generation rocket to transport people and cargo to deep space, is based there. Boeing has two major facilities in Huntsville, one developing missile-defense systems and the other a research and technology design center that supports multiple commercial-airplane programs and defense systems.